Check out this incredible artist guitar from Fender made in the custom shop by Gene Baker.. This instrument is a one off guitar that was assembled by some of the best makers - including Gene Baker (Fender USA) - Sims Leds (UK) - and of Course Lace Sensors (USA). The quality is simply superb and this instrument was the first (and only) 24 fret Fender Stratocaster in the world. It is likely that this instrument embodies many features that were applied as prototype designs so check out other newer Fender guitars and the day when your Strat has one or more of these great enhancements as standard. No manufacturer goes to these lengths with one off design without an ulterior motive, either feasibility studies, production costing or maybe just a way of testing great new innovative designs of various components - together making 'The Dream' that all guitarists have in their own mind - this web site is a reflection of one 'Dream' Strat that is simply like no other Fender Stratocaster ever made in the world today. Today this guitar is owned by 'Ginger Pete' a guitar collector from Las Vegas. This guitar was originally bought directly from the artist Awesome John by Tony Mckenzie. Needless to say that the guitar had been played professionally and there were many things that were showing signs of wear and tear from a hard life on the road. So Tony checked out the guitar when it arrived and decided to refurbish the guitar to as original as he could by contacting all of the professionals that originally were involved in making the guitar. These included Gene Baker, Jeff Lace of Lace pickups, Martin Sims from Sims Leds and some others. Every single person involved in the refurbish donated the parts or work for free as they wanted the guitar to be as near to it's original condition as possible. 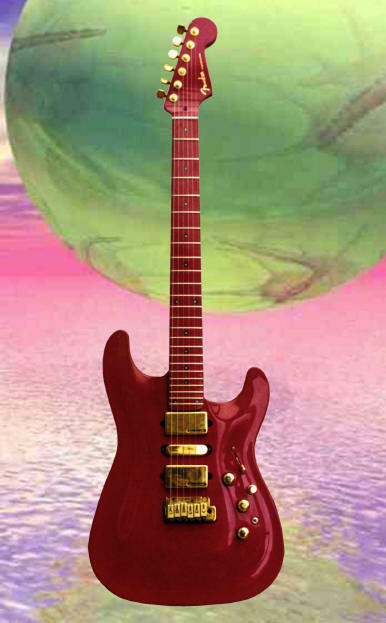 You will see on these pages that each company or person went out of their way to recreate the guitar that is 'The Dream'. This site goes some way in showing you an insight to a guitar that you would never normally see - a review of this 24 fret through neck stratocaster - the only one ever made.. This web site is ©&® A.B.McKenzie 2002-2016. All Rights Reserved. Bigdan Recording Studios is a trade name of tonymckenzie.com. Visit www.tonymckenzie.com to see other useful information about the contents of this site and other musicians. 'Strat' and 'Stratocaster' is a trade mark of Fender Musical Instruments USA. This site is not associated or affiliated in any way with Fender Musical Instruments or any other company featured on this site. Copyright 2001-2016. A B Mckenzie. All Rights Reserved. All Trademarks Acknowledged.